It was in England in the first quarter of the century when someone had the inspiration that boys should wear sailors' trousers. English seamen had been dressing in pantaloons since the seventeenth century and English boys adopted trousers a half century before their fathers did. English children were the first to be emancipated, little girls changing to soft, unlined frocks in the 1770's with France and the Colonies following next. Some well-known writers had taken the age to task for its manner of confining infants' bodies in tight clothes, among them John Locke, the English philosopher (1632-1704), who was probably the big influence in the change. He was followed by Jean Jacques Rousseau, the French philosopher (1712-1775), who carried on the crusade and was forced to flee Paris for England because of his revolutionary ideas. Although the change over to trousers occurred early in the period, knee breeches were still worn for dress as can be seen in contemporary portraits. The writings of the Age of Reason were having an effect in putting children into comfortable-clothes, like skeleton suits or sailor suis. The sailor trouser costume known as the English sailor's dress being a short little jacket with an open-necked blouse, a waistcoat without skirts and the long breeches. 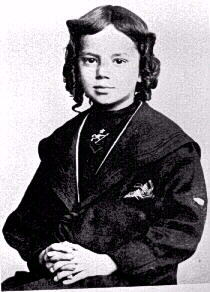 British parents in the 19th Century commonly dressed children in sailor suits, especially the boys. 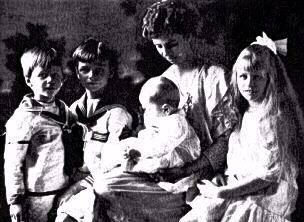 The style oncreased in popularity after Queen Victoria regularly dressed her sons and even daugters in sailor suits. The style was worn by smaller boys through the 1860s. One fashion magazine, Englishwoman's Domestic Magazine, in 1861 suggested sailor suits for boys of 6 or 7. By the 1870s sailor suits were one of the most popular styles for boys up to 12 or 13 and even older ages on the Continent. Jersey suit: Knitted jersey's appeared during the 1860s and were popular at the seaside in the 1880s. One fashion columist in Myra's Journal (1884)wrote, A robust agile rogue of 6 or 7 never looked so well as when his shapely figure is displayed by his close-fitting knee breeches and jersey ... being woolen hey keep the body in a due state of warmth ...on the head is either a Tan-o-shanter or a kind of brewer'd cap ... of the sanme kind of stockinette as the suit. Jersey suits were often very plain without all the details on other styles. Man-of War suit: This style was particularly popular during the early 19th Century. It was more commonly worn with long trousers than many of the other styles. Usually worn with a wide-brimmed straw sailor hat. A complete sailor suits were made up of a middy blouse, long or short pants, skirts (for girls and small boys), and sailor hat. Blouse: The blouse had a deep square flat collar and "V"-shaped neck opening in front showing the vest or dicky. Pants/skirt: Boys in the Victorian era wore either long or short pants with their middy blouse, however, by the Edwardian period knee-length pants were almost universal. Smaller boys might wear a modified kilt-like sailor suit with a regulation middly v\blouse worn with a white or blue kilt-like skirt. Girls and younger boys wore skirts/kilts. 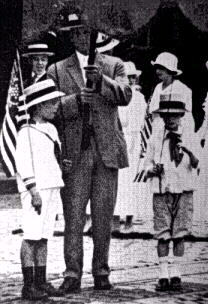 Hats: Several differeny styles of hats were worn, determined by the style of suit chosen and the whims of the mother. Some of the most common in the 19th Century were broad brimmed sailor hats. English boys also wore the flat topped cap cloth cap worn by more modern British sailors, also with a ribbon dangling at the back. French and German boys wore the caps worn by the sailors in their navy. The boys generally preferred sailor suits to other alternatives such as kilts and Fautleroy suits. One fashion colunist writing in The Lady's World (1887) indicated that A boy before he rises to the dignity of trousers and jackets is never as happy as in a Middy suit or Jack Tar, and these suits are now selling in thousands. The style became very popular in America and many European countries, especially Germany and Italy where they were mostly worn with short pants. The sailor suit was one of the most popular fashions of the end of the 19th century for both boys and girls. Boys wore the tunic with long pantaloons or increasingly popular straight knee pants. After the turn of the century shorts appeared, but until after the First Wrl War (1918) continued to be rather long. Girls wore the tunic with the kilted skirt. The suits were made in blue or white serge for winter and of French flannel, linen or duck for summer. Boys continued to commonly wear sailor suits in Europe and America through the 1920s and 30s. Quite old boys wore saiolor suits on the comtinent during the 1920s and 30s, often with short pants. This was particularly true in Germany. British boys generally didn't wear sailor suits commonly after 8 or 9. This was because boys from affluent families generally were sent off to boarding school at about 8 years of age. These boys generally did not want to wear sailor suits as they would be teased by the oyher boys. Instead they tended to wear their school uniforms. In both America and Britain by the 1940s, only younger boys were dressed in sailor suits. The fashion for older boys eventually passed out of fashion on the continent after World War II (1945). Uniforms in general passed out of favor in Germany as well as other countries. The styles and materials for the middy blouse varied greatly. Authentic ones included three white stripes for Nelson's three great victories. Sailor suits were generally blue or white, worn with maching stckings. The white suits were generally worn during the summer.